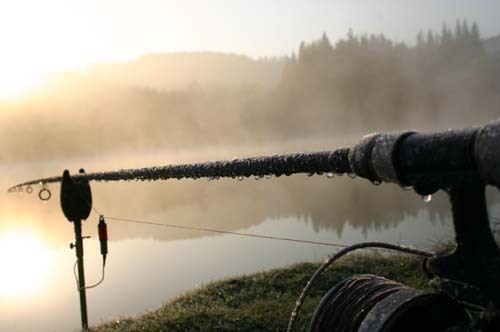 Tucked away in the heart of the beautiful French countryside, lies the ultimate carp fishing experience. Welcome to Paradise Lakes. Carp Fishing in France at Paradise Lakes is the ultimate carp fishing holiday. Paradise Lakes is situated in Foret-de-Limousin set in 35 acres of private grounds. Due south approximately 400 miles from Calais, with the nearest city being Limoges, capital of the Haute-Vienne. Reaching our carp fishing resort in France couldn’t be easier, with a comfortable drive heading South, the motorway system will take you to within 5km of the lake. Upon arrival you will be greeted with a warm welcome from our team, led by Tony and Adam. Then after a short tour of the carp fishing lake and the excellent facilities, you will be able to relax and enjoy the finest big carp fishing holiday. We will cook all your food for you through out your trip, making your carp fishing holiday accommodation as comfortable as possible. Please navigate through the website to find out more information on the facilities at Paradise Lakes, making sure you read through the carp fishing holiday bookings page and read our terms of carp fishing before you contact Paradise Lakes. If there is anything you can't find, or you wish to place a booking then please email or call us and we will be glad to help. Country: Albania Algeria American Samoa Angola Anguilla Antigua And Barbuda Argentina Armenia Aruba Australia Austria Azerbaijan Bahamas Bahrain Bangladesh Barbados Belarus Belgium Belize Benin Bermuda Bolivia Bosnia And Herzegowina Botswana Brazil Brunei Darussalam Bulgaria Burkina Faso Cambodia Cameroon Canada Cape Verde Cayman Islands Central African Republic Chad Chile China Colombia Comoros Congo Cook Islands Costa Rica Cote D'ivoire Croatia Croatia (Hrvatska) Cuba Cyprus Czech Republic Denmark Djibouti Dominica Dominican Republic Ecuador Egypt El Salvador Equatorial Guinea Eritrea Estonia Ethiopia Faroe Islands Fiji Finland France French Guiana French Polynesia Gabon Gambia Georgia Germany Ghana Gibraltar Greece Greenland Grenada Guadeloupe Guam Guatemala Guinea Guyana Haiti Honduras Hong Kong Hungary Iceland India Indonesia Iran Ireland Israel Italy Jamaica Japan Jordan Kazakhstan Kenya Kuwait Kyrgyzstan Laos Latvia Lebanon Lesotho Lithuania Luxembourg Macedonia Madagascar Malawi Malaysia Maldives Mali Malta Marshall Islands Martinique Mauritania Mauritius Mexico Micronesia Moldova Monaco Mongolia Montserrat Morocco Mozambique Myanmar Namibia Nauru Nepal Netherlands Netherlands Antilles New Caledonia New Zealand Nicaragua Nigeria Northern Mariana Islands Norway Oman Outlying Islands Pakistan Palau Panama Papua New Guinea Paraguay Peru Philippines Poland Portugal Qatar Reunion Romania Russia Saint Kitts And Nevis Saint Lucia Samoa Saudi Arabia Senegal Seychelles Singapore Slovakia Slovenia Solomon Islands Somalia South Africa South Korea Spain Sri Lanka St. Pierre And Miquelon St. Vincent And The Grenadines Sudan Suriname Sweden Switzerland Syria Taiwan Tanzania Thailand Togo Tonga Trinidad And Tobago Tunisia Turkey Turks And Caicos Islands Uganda Ukraine United Arab Emirates United Kingdom Uruguay USA Uzbekistan Vanuatu Venezuela Vietnam Virgin Islands (British) Yemen Yugoslavia Zaire Zambia Zimbabwe Ignore this text box. It is used to detect spammers. If you enter anything into this text box, your message will not be sent. Largest Fish: 65lb PLENTY IN THE TANK. Additional carp fishing images are available to view in the Paradise Lakes carp fishing image gallery.